This machine will drill both ends of your louver while adding a staple to the precise center of the louver in one motion by depressing a foot pedal. The maximum louver length for our standard machine is 33” and as small as 6”. The change over time to accommodate louver width is less then a minute and requires no tools. 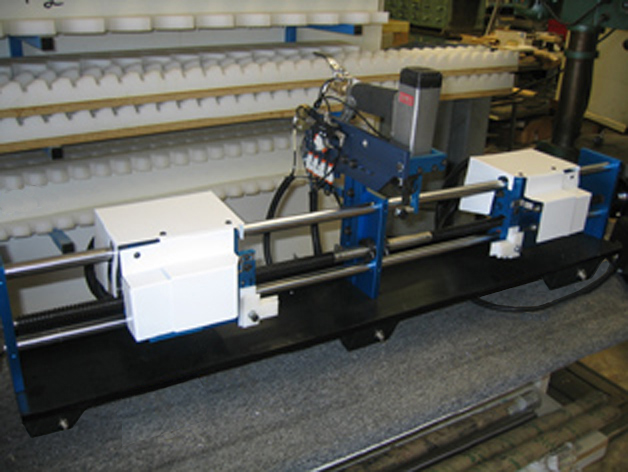 All of our machines are set up using your actual supplied material. This machine will take all the work out of drilling and stapling the louver for you by centering each drilled hole to the height and width of your louver saving you work at assembly and you will find that your panels will operate with ease and close equally. If you decide to change your type of material in the future, this machine can easily be adjusted to except this change and be back up and running in only a few minutes. This machine is totally adjustable from staple depth, drilling depth and drilling feed rate. Required : 110 volts AC,10 Amps Electrical, and Requires a minimum 80 PSI, and a maximum 150 PSI of air pressure. Adding drilling spindles to accommodate drilling for clear view, (hidden tilt bar). Adding an offset stapler to put the tilt bar off center. We can accommodate any louver length upon request.